Specifically designed to meet the needs of digital photographers, the Digital ColorChecker® SG target includes the highest quality color reference standards available. Each of the 140 patches was chosen for its location in color space to expand the color gamut, so you can create profiles that capture the full capabilities of your digital camera and scanner. 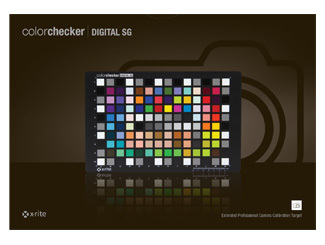 ColorChecker Digital SG provides the same great value as the ColorChecker Classic to compare digital reproductions to real life scenes or test targets. 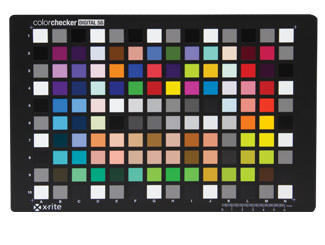 The ColorChecker Digital SG takes a step beyond the traditional ColorChecker by representing a larger gamut and providing greater refinement of individual colors. Simply include ColorChecker Digital SG in your first photo if you’re shooting JPEG or traditional, or any photo in the series if you’re shooting Raw. Later, in the studio, use it to compare, measure and analyze differences in color reproduction in any color rendition system. This objective standard will help you avoid costly mistakes and trial-and-error color correction after the fact. Digital Photography: Check images, correct white balance and perform extensive color analysis for correction. Film Photography: Check films, lights, filters and paper. Graphic Arts: Check any printing or proofing process. Scanner Profiling: Create custom ICC scanner profiles with i1Profiler software (sold separately). Pair with i1Profiler scanner profiling software (sold separately) to create a custom ICC profile of your scanner.